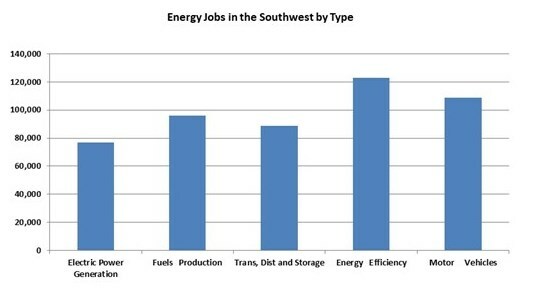 Which Segment of the Energy Industry Supports the Most Jobs in the Southwest? The Powder River Basin in Wyoming is the largest coal-producing region in the U.S. There are tens of thousands of oil and natural gas wells as well as over 1,900 wind turbines operating on the Eastern Plains of Colorado. Eastern New Mexico is a major oil and gas producing region, and large-scale solar power plants are sprouting up across the desert Southwest. But which segment of energy industry supports the most jobs in the energy-rich Southwest? Answer: It’s the energy efficiency industry, according to the 2017 U.S. Energy and Employment Report prepared by the U.S. Department of Energy (DOE). If public officials want to expand energy-related jobs, they should start by supporting energy efficiency initiatives including the federal energy efficiency programs funded by the DOE and EPA. The chart below shows total energy employment for the major categories considered in the DOE report for the six states that SWEEP works in—Arizona, Colorado, New Mexico, Nevada, Utah and Wyoming. According to DOE, there were over 122,700 energy efficiency jobs in the region in 2016, while there were about 95,800 jobs in fossil fuels production, about 77,100 jobs in electric power generation, and about 88,500 jobs in energy transmission, distribution and storage. Also, in 2016 the region had about 108,550 motor vehicles-related jobs, primarily in vehicle maintenance and repair. sell and install energy-efficient heating, air conditioning and lighting systems. 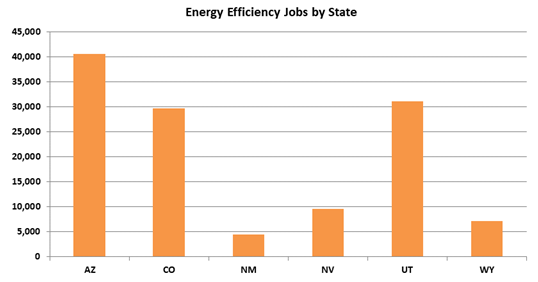 The second chart shows the number of energy efficiency jobs for each state in the Southwest. The number ranges from less than 5,000 in New Mexico to more than 40,000 in Arizona. The variation among states is due to the types of businesses in each state as well as the relative size of the states. Energy efficiency represents the largest category of energy employment in the nation as a whole, as well as in Arizona, Utah and all Southwest states combined. 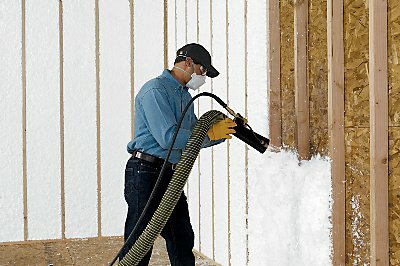 Johns Manville employs 200 workers that produce insulation products and insulation manufacturing equipment in plants in Colorado and Nevada. In addition, Johns Manville employs over 400 people in energy efficiency business management and R&D across the Southwest. PulteGroup has built over 50,000 ENERGY STAR® homes in Arizona and Nevada since 1996. PulteGroup employs 370 workers in these two states. Honeywell employs 200 workers in the region that manufacture, market and install building controls and other energy-efficient buildings systems. Colorado Lighting is a family-owned business that specializes in installing and servicing energy-efficient commercial and industrial lighting. Colorado Lighting employs approximately 100 technicians and other workers. EnergyLogic is another family-owned business employing over 50 staff that performs home energy ratings and provides other energy efficiency services to builders and home performance professionals in Colorado. Energy efficiency jobs are stable and growing in number, and they are not subject to “boom and bust” cycles like fossil fuels. Increasing energy efficiency is also more labor-intensive (and less capital-intensive) than supplying energy from new power plants, coal mines, or oil and natural gas wells. Moreover, the jobs often are created by small businesses, meaning energy efficiency lends itself to entrepreneurship. These factors underscore why public officials who truly want to expand energy-related jobs should support energy efficiency initiatives, including federally funded programs. Howard Geller is the Executive Director of the Southwest Energy Efficiency Project (SWEEP), a public interest venture he founded in 2001. Howard also leads SWEEP’s work on utility energy efficiency policy and programs. Strategic energy management (SEM) is a holistic, systematic approach towards improving a company’s (or facility’s) energy performance. The goal of SEM is to help the company achieve significant energy and cost savings, and the associated environmental benefits, over the long term. The key principles of SEM include setting long-term goals for energy savings and putting in place systems to measure energy use and track progress towards these goals. SEM also involves developing and training an energy champion and energy team to identify and implement a series of projects, including capital projects as well as low-cost operation and maintenance measures. Utility energy efficiency programs support companies in these efforts, by providing incentives for equipment upgrades, to help more projects fall within the companies’ acceptable payback window. Some utilities also have programs to provide customers with training and coaching in SEM principles.